The DRFC will be sending a strong squad to participate in the 5th USA Sevens Collegiate Rugby Championship this weekend, May 30-June 1 at PPL Park, 1 Stadium Drive, Chester, PA, about 20 minutes south of Philly. We have an action and fun filled weekend of Dartmouth activities planned as you will see below. 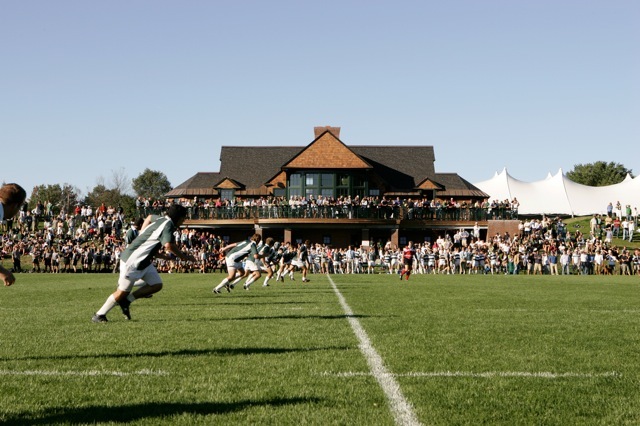 Please plan to join us for all or part of the weekend, wearing Dartmouth Green so we show up as block on NBC and NBC Sports Network – it's a great weekend for us to further the brand of Dartmouth Rugby!! Friday evening, 7 PM – Dartmouth All Green Alumni team will take on a U of Michigan Alumni team in the first ever "Tom Fagan Memorial Cup" match. Tom was a Dartmouth Class of '67 rugger who passed away last year. He also played rugby for the Michigan team while in law school there. He has a lot of family and friends from both schools who will be attending. There will be a gathering following the match at the Roosevelt Pub (aka R-Bar), 2220 Walnut Street at 23rd, which is just across the river from the fields heading back into Center City. All friends of Dartmouth and Michigan rugby are warmly invited to attend. Saturday May 31 – The Dartmouth team will play Notre Dame at 1:36 PM and then Kutztown University at 4:36 PM. Gates to the stadium will open at 10AM. We hope that all Dartmouth fans will join us in the parking lot B from 11AM to 1PM for food and beverages and to amp up the support for the team. Look for the Dartmouth banner in the parking area. Saturday evening – The DRFC Board of Governors will be hosting a get-together for all friends and family of Dartmouth Rugby at Moriarty's Pub, 1116 Walnut Street, in Center City Philadelphia (same place as last year). Light food and cash bar at 7:30PM. Plan to stop by to meet up with DRFC friends before you head out for the night's activities! Sunday, June 1 – when the team plays on Sunday will be determined by the results on Saturday, but if we make the Championship round, the first game kickoff will be between 10:20 and 11:20 Sunday morning. Sunday's play is single elimination. Gates to the stadium will again open at 10AM. As of now the Sheraton Hotel is fully booked, but rooms are still available at the Sofitel Hotel at a special CRC guest rate of almost 50% off. If interested, please call the Sofitel Hotel at (215) 569-8300 and use the reference code "RUGBY" to get the special CRC rate. The Sofitel Hotel is within walking distance of the Sheraton Hotel and is surrounded by prime restaurants, bars, and shopping on Rittenhouse Square. And if you come to Philly, please remember to wear your Dartmouth Green!